Leonard Cohen has been bestowed with the 2011 Prince of Asturias Award for Literature. The decision was announced by the Jury in Oviedo today. Considered one of the most influential authors of our time, his poems and songs have beautifully explored the major issues of humanity in great depth. Leonard Norman Cohen was born in Montreal (Canada) in 1934 into a family of Jewish emigrants. Interested in literature from childhood, he graduated in this subject from McGill University, Montreal in 1955. He first came into contact with music at this time, forming part of The Buckskin Boys, an amateur country-folk group. He later moved to New York thanks to a scholarship that allowed him to study at Columbia Graduate School. He received a grant from the Canada Council in 1956 to write a book and published his first book of poems, entitled Let us Compare Mythologies, inspired by Federico García Lorca, for whom he has always expressed great admiration. This is a compilation of poems written between 1949 and 1954, in which Leonard Cohen reflects on the themes that are to be recurrent in his work, such as the persecution of the Jews, relationships and religion. Author of thirteen books, in the 60’s he set up home for a time on the island of Hydra, Greece, and started to compose songs, though without forsaking literature. During these years, he published his second book, Spice-Box of Earth (1961), his first novel, The Favourite Game (1963) and a new book of poems, Flowers for Hitler (1964). These were to be followed by the novel Beautiful Losers (1966), the collection of poems Parasites of Heaven (1966) and the works The Energy of Slaves (1972) and Book of Mercy (1984). Book of Longing (2006), a collection of poems, prose and drawings, was the first poetry book to reach the top of list of best selling books in Canada. He published Poems and Songs in 2011. He returned to the USA temporarily in 1967 and published his first record, Songs of Leonard Cohen, which included some of his best-known songs such as Suzanne and Sisters of Mercy. This album was followed by Songs from a Room (1969), which received great public acclaim, and Songs of Love and Hate (1971), which confirmed him as one of the most outstanding songwriters of the time. He toured worldwide throughout the 70’s and 80’s, as well as publishing albums such as Live Songs (1973), New Skin for the Old Ceremony (1974), Death of a Ladies’ Man (1977), Recent Songs (1979) and Various Positions (1984), whose song Hallelujah has cover versions by over 150 different artists. He subsequently published I’m Your Man (1988) and The Future (1992), in which he managed to convey the spirit of his time perfectly. Since then, he has recorded Ten New Songs (2001), Dear Heather (2004) and Blue Alert (2006). After celebrating his 40th anniversary as an artist, Cohen gave 84 concerts all over the world in 2008, attended by more than 700.000 people on a tour that meant his return to the stage after an absence of 15 years. He subsequently edited Songs from the Road, a live album recorded during the tour that includes his most emblematic songs. 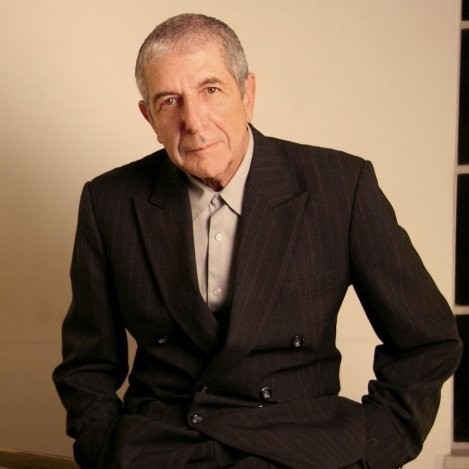 Admired by renowned artists, many have interpreted his songs and have recorded tribute albums like I’m your Fan (1991), Tower of Song (1995) –in which singers such as Billy Joel, Sting, Elton John and Bono participate–, Leonard Cohen: I’m your Man (2006) and According to Leonard Cohen (2007). He is an Officer and Companion of the Order of Canada, the country’s highest-ranking civilian order, and a Grand Officer of the National Order of Quebec. In 2008, he entered the Rock and Roll Hall of Fame and was distinguished with the Grammy lifetime award in 2010. He was awarded the Glenn Gould Prize in 2011. This year a total of 32 candidatures from Argentina, Austria, Australia, Bosnia, Brazil, Canada, Czech Republic, Cuba, Chile, China, France, Guatemala, Georgia, Iran, Italy, Lebanon, Netherlands, Macedonia, Mexico, Portugal, Rumania, South Africa, United Kingdom, United States and Spain ran for the award. This is the fifth of the eight Prince of Asturias Awards to be bestowed in what is their thirty-first edition. The Prince of Asturias Award for the Arts went to Italian conductor Riccardo Muti, the Prince of Asturias Award for Social Sciences was given to US psychologist Howard Gardner, the Prince of Asturias Award for Communication and Humanities went to British institution The Royal Society and the Prince of Asturias Award for Technical and Scientific Research was jointly bestowed on neuroscientists Joseph Altman, Arturo Álvarez-Buylla and Giacomo Rizzolatti. The Award for International Cooperation will be made public next week. The Prince of Asturias Awards for Sports and Concord will be announced in September.